The 2/14th Australian Field Regiment was an Australian Army artillery unit that served during the Second World War, within the 8th Division. 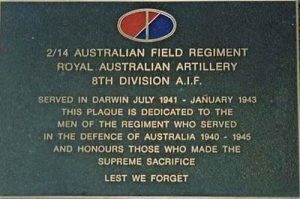 Raised in 1940 they remained in Darwin as a garrison force at a time when the division’s infantry brigades were deployed to Southeast Asia to counter the Japanese threat. They deployed overseas in late 1943 once the threat to the Australian mainland had subsided. The 2/14th supported the 5th Division’s operations on New Guinea throughout 1944 before accompanying them to New Britain in early 1945, where they engaged Japanese forces on the island until the end of the war, at which point they undertook garrison duties on Rabaul as part of the 11th Division, before returning home and disbanding in January 1946. The 2/14 Australian Field Regiment will be supported by students and staff of Christ Church Grammar, as participants in the Shrine’s Adopt an Ex-Service Organisation program. This partnership fosters relationships and enables schools to carry on the legacy of their chosen Association.